Posted on Thu, Mar 22, 2012 : 12:20 p.m.
Bell's Oberon waiting in an undisclosed location to be released Monday. >> Many Michigan fans may have quit following the college basketball extravaganza known as March Madness, but if you're a Sparty (or if you have a bracket still in contention), you may as well watch the action with a good beer in front of you. Fraser’s Pub, 2045 Packard, aims to please with a 4 p.m. tapping of its first-ever firkin, and the delicious contents are none other than Bell’s Two Hearted Ale. And if that runs out, many of the pub’s "Sweet Sixteen" taps are devoted to other delicious craft beers. >> What do you get when you mix three different breweries and a cool annual downtown Ann Arbor parade? You get FoolBrew Spiced Belgian Wheat Ale, a 7 percent alcohol-by-volume (ABV) witbier created by Blue Tractor, Grizzly Peak and Jolly Pumpkin in honor of the upcoming FestiFools parade on April 1 (and the FoolMoon street party March 30). It's brewed with the traditional witbier ingredients of orange peel and coriander, but the creative elves added green tea and pink peppercorns into the mix as well. Enjoy a glass of FoolBrew at any of the three collaborating pubs (each has its own slightly different version) beginning at 5 p.m. For $6, you get a FoolBrew keepsake glass that can be refilled with the beer for $3, or drink it from a regular glass for $5 a pop. Proceeds help fund FestiFools and FoolMoon. >> Yes, spring is here, and summer’s not far behind. And with the crazy hot weather we’ve been having already, you must be thirsty. 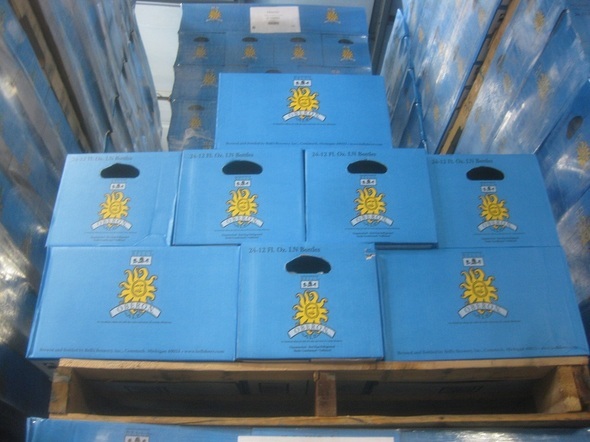 Why not quench that thirst with Michigan’s unofficially official Beer of Summer? That's right, Bell’s Oberon Ale is back for the season, and several local establishments are celebrating with midnight tappings of the refreshing, mildly fruity wheat brew everyone goes gaga for. Conor O’Neill’s, 318 S. Main, hosts a midnight tapping as well, with $5 imperial pints, prizes and a toast for the first pint. >> You know the concept of pairing beer with food has caught on big when long established and beloved local institutions take to the idea. From 6-8:30 p.m., the venerable Knight’s Steakhouse, 2324 Dexter, hosts its very first beer dinner with five courses of surf and turf cuisine Knight’s is known for along with five full bottles of beers from Michigan Brewing, Saugatuck Brewing and Newcastle to go with it all. Tickets are just $25 in advance ($30 at the door) and you can reserve tables for groups of two, four or six — or go by yourself or with an odd number and meet new friends! Call 734-665-8644 to reserve, and check this most excellent blog for the full menu. >> The Ann Arbor Film Festival (AAFF) returns for its 50th year, and to celebrate, Arbor Brewing, 114 E. Washington, is releasing a special beer to commemorate the nation's oldest independent film festival. The Color of Infinity Inside an Empty Glass reflects the off-kilter personality of both the AAFF and the beer’s creator, brewer Logan Schaedig. Stop by any time after Arbor opens for a glass of this wheat ale made with orange peel, ginger, and tamarind. It will also be featured at the festival itself. >> Later on, from 6-8 p.m., Arbor hosts a release party for Buzzsaw IPA, an award-winning West Coast-style hop bomb of Simcoe, Amarillo, and Centennial varietals created by bona fide hophead Bill Gerds. Its name comes from Ann Arbor’s original growth industry (that would be lumber, y’all), and you can enjoy glasses of it along with light snacks and discounts on to-go purchases (50 percent off growlers of it) for the duration. Free for Mug Club members or just $10 for visitors and guests. >> Maybe your taste buds haven’t gotten enough of that bitter, hoppy goodness. Well, then, point your feet to Ashley’s for a night of imperial IPAs, double IPAs, and double secret IPAs on tap beginning at 6 p.m. Featured tongue bruisers include Buzzsaw, Arcadia Hop Rocket, Avery Maharaja, Bell's Hopslam, Dark Horse Double Crooked Tree, Dogfish Head 120 Minute, Founders Double Trouble, New Holland Hopivore, and Victory Hop Wallop. It’s a hophead’s paradise! >> The post-Rat Fest bounty continues, with offerings from the Brighton Brew Club being featured at the Corner Brewery, 720 Norris, Ypsilanti, beginning at 6 p.m. The BBC (not to be confused with the British TV network) brewed up batches of Imperial Bourbon Cherry Stout; Peppermint Patty Porter; Tiger Tea (a brown ale brewed with chai); and, most interestingly, Loaded Baked Potato, made with potatoes, chives, bacon and home-grown hops. Some or all will be available, depending on availability, and if there’s any left at 9 p.m., you can take home a growler of your favorite. The upcoming Chelsea Alehouse is now officially something more than just a dream on paper, as owner and future head brewer Chris Martinson announced on the Facebooks this week that he has secured a location for the brewery at the Factory Building, one block off Main Street in downtown Chelsea’s Clocktower Commons. Follow along on Facebook and Twitter for the latest news. You know what would be awesome? More options for drinking beer outside in the warm Ann Arbor summer. You know what’s even more awesome? Mark Hodesh, owner of Downtown Home & Garden and Mark’s Carts, is teaming up with his longtime business associate Bill Zolkowski to create Bill’s Beer Garden. The proposed drinking space will occupy part of Downtown Home & Garden’s parking lot and be linked to Mark’s Carts so you don’t need to drink on an empty stomach. Michigan craft beer and wine, live music and other entertaining events are all part of the planned garden, expected to open on the corner of Liberty and Ashley sometime around midsummer. See this AnnArbor.com story from Lizzy Alfs for details. If you’re out Plymouth way, Liberty Street Brewing, 149 W. Liberty, has a treat for you: Siamese Dream (aka Liberty Two) Double IPA is on tap and ready to belt you with 122 IBUs (you read that right) and 9.8 percent ABV. Better bring a driver. Also, owner and brewer Joe Walters just brewed 42nd Parallel Double IPA, which will be ready soon. In meantime, enjoy Joe’s birthday bash on Saturday with jam band Four Block Empire in the upper hall and plenty of great brew on tap. David Bardallis is a freelance writer and editor, blogger, bon vivant and man about town. Visit “All the Brews Fit to Pint” at AnnArborBeer.com, follow @allthebrews on Twitter, or join the "All the Brews Fit to Pint" Facebook page. Email your beer-related thoughts to annarborbeer@gmail.com. Fri, Mar 23, 2012 : 4:48 p.m.
Wow people must be really passionate about their hatred for Oberon if they spend this much time trying to convince people that it is a bad beer. Your comparing an apple to an orange, an IPA to a wheat. Perhaps you prefer IPA's over wheat beers. Fri, Mar 23, 2012 : 5:16 p.m. I don't hate Oberon I just think it has an inflated reputation. I do drink it from time to time but given a choice I would choose a Sierra Nevada over Oberon most times. Fri, Mar 23, 2012 : 3:22 p.m.
Fri, Mar 23, 2012 : 4 p.m.
Fri, Mar 23, 2012 : 3:28 p.m.
Now that's just crazy talk. Thu, Mar 22, 2012 : 11:17 p.m. I miss Solsun!! please do not try and tell me it's the same. Thu, Mar 22, 2012 : 11:08 p.m. I think all you Oberon bashers are really over thinking this thing. As a beer fanatic, I definitely would prefer a high gravity beer like a wee heavy or a Belgian dark when I'm in a pub or hosting a dinner party. But when you have a backyard bbq with your friends and family, and it is a nice Michigan summer day, there is nothing better than a pint of oberon from the mini keg. It's about ambience and mood. A Belgian Ale would be hard to stomach on a hot day on the patio. Oberon goes down like lemonade. Thu, Mar 22, 2012 : 8:39 p.m. I look at Oberon as a gateway beer. A nice bridge between macro-swill and the good stuff. Thu, Mar 22, 2012 : 8:20 p.m.
Add me to the list too. The 25th Anniversary was the best Bell's beer I have had. However, since bikini season is upon us I am sticking to the lighter pilsners. Also, anyone know a place in town selling Hamm's beer. I saw it when I was up north in February. Fri, Mar 23, 2012 : 10:27 p.m. Try the Meijer's on Jackson. Genny Cream Ale 30 packs too a little while back. Let me know when they bring back Altes! Thu, Mar 22, 2012 : 9:16 p.m. Thank you kind sir. It is from my formidable years, and they had the best commercials ever. Thu, Mar 22, 2012 : 8:50 p.m. I saw Hamms in CJ's Party Store on North Territorial Road in Webster Twp. Thu, Mar 22, 2012 : 8:17 p.m.
Thu, Mar 22, 2012 : 8:12 p.m. It is, admittedly, not even my favorite Bell's beer, but a lot of people do love it and it's helped bring many new converts into the world of craft beer, so I think that's worth a toast! Fri, Mar 23, 2012 : 3:20 p.m.
Thu, Mar 22, 2012 : 7:32 p.m.
Ah, yes Oberon. It's what people drink when they want to think they are drinking good beer. OVERRATED! Fri, Mar 23, 2012 : 3:19 p.m.
Thu, Mar 22, 2012 : 6:17 p.m.
One of the most overrated beers in Michigan. Nothing screams summer like a Sierra Nevada Pale Ale or Bell's Two-Hearted. Fri, Mar 23, 2012 : 3:18 p.m.